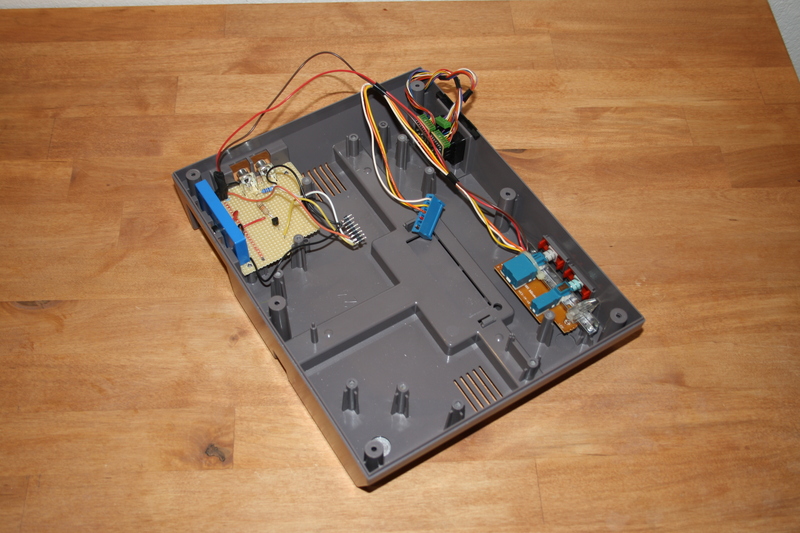 I was looking for a broken NES so I could use its case for a project I’ve been thinking about. I found one on eBay at a reasonable price, so I bought it. Once I got the unit, I found out that it had the infamous “flashing red LED” problem, which was easily remedied by disabling the lockout chip. 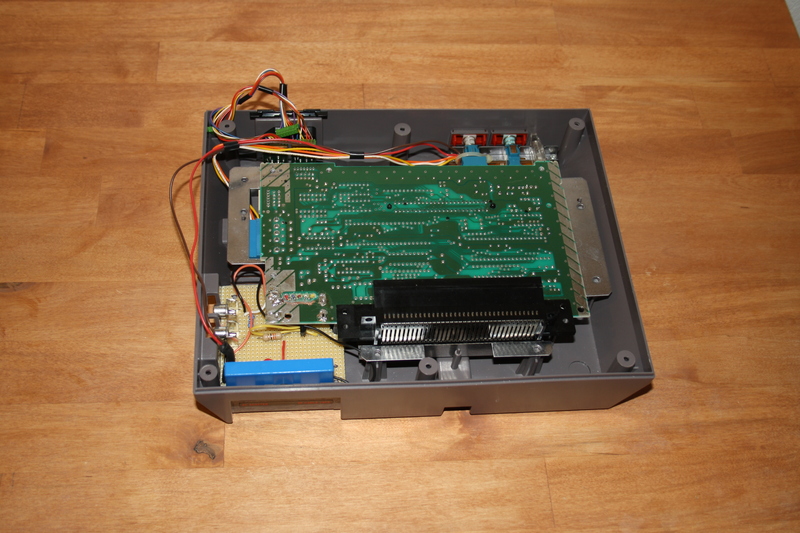 After that I couldn’t just gut the poor thing, as the unit might have been fine, so I inserted a game, connected a TV with an RF cable, and turned the NES on. Connecting the unit with the AV cables gave better results: The video still had the lines, but now there was audio. I googled for a bit, and found out that this may be caused by a faulty RF-modulator unit. The solution would be removing the unit, and adding new AV connectors as well as a new video amp. After removing the RF box, you will see 5 holes with contacts. Hold the board so it is in the upper-left corner and they are as follows (from left to right): Power, Reset, +5v (if you connect it here, it will go directly into the system, this is usually where the output from the Power switch goes), audio out, and weak video output. I would also have to provide +5V DC to power the unit, as the original regulator and rectifier are parts of the RF-modulator. The first order of business was removing the RF-modulator unit. I managed to de-solder the whole thing in more or less one piece, but thinking back, I probably should have just cut it off in pieces. In this picture I’ve already added header connectors for the five contacts that were connected to the RF-modulator, as well as two more for GND (top left of the image). 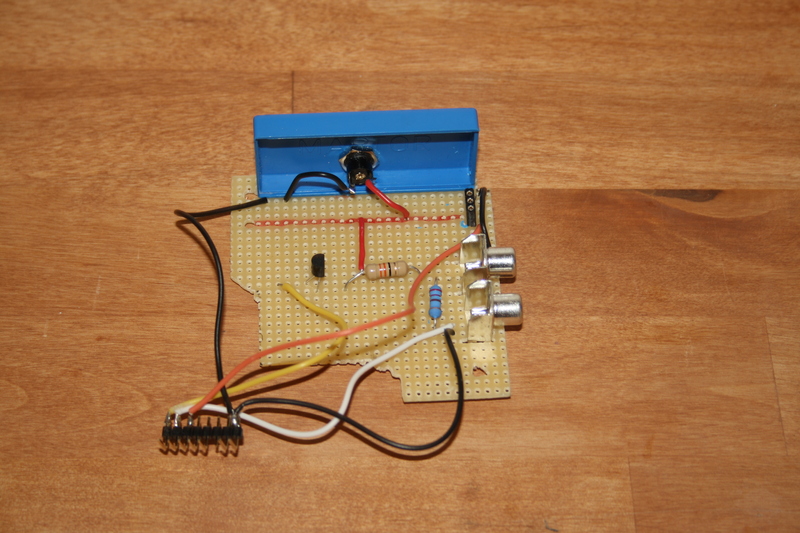 In the end I only needed to use three of the pins: The audio and video signals and “+5V” as described on the forum. Next, I needed new AV-connectors, a new power connector, and the replacement video amplifier. I mounted all of this on a piece of strip board. 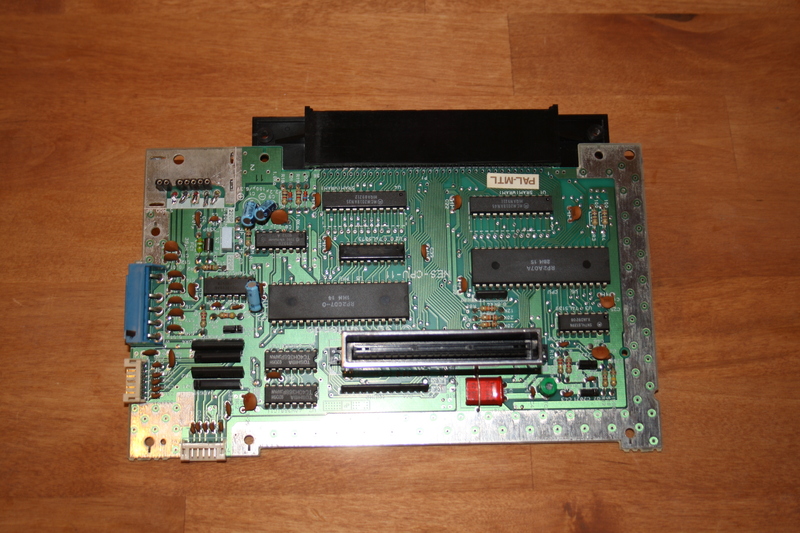 The board could’ve been much smaller, but I wanted to be able to use the original mounting holes on the NES. The blue plastic piece is a box for hobby knife blades that I happened to have laying around. It was the perfect size for mounting the power connector on the board. I used a 4mm connector instead of the original 5.5mm one to make sure no-one (i.e. me) accidentally plugs in an original NES PSU. 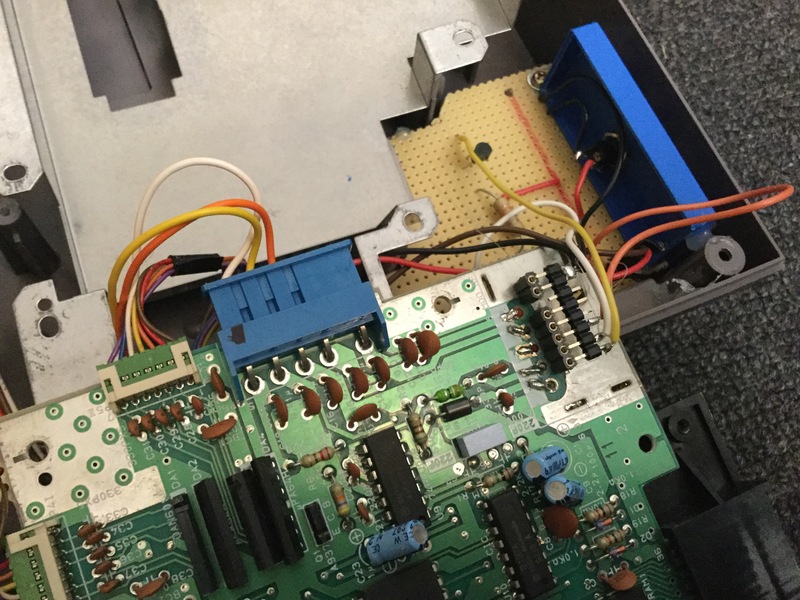 Connecting 9V AC to the parts of the NES that expect 5V DC wouldn’t be pretty. I got a 5V wall wart to use as the PSU, and swapped a 4mm connector on that one as well. 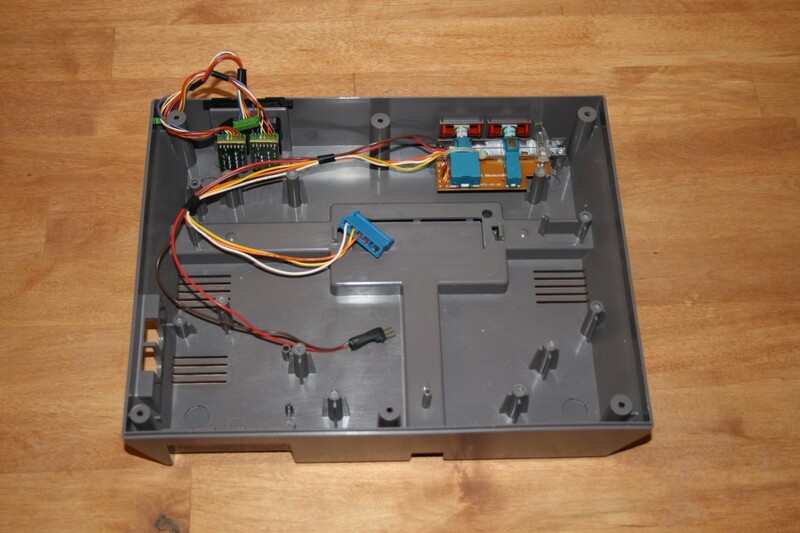 – The black wires connect NES GND to strip board GND and power supply GND. After this bypass/transplant operation the patient is feeling fine. The only problem is some hum in the audio, so I might try using a shielded cable for the audio signal in case that’s the problem. 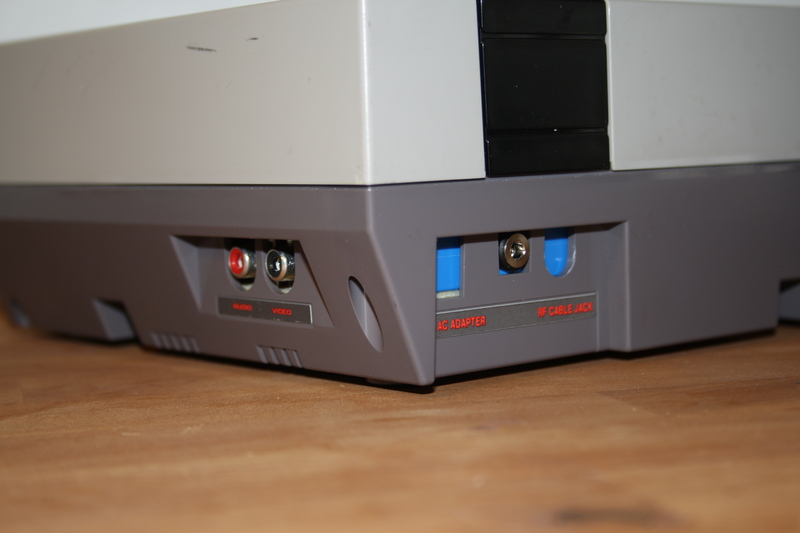 Other than that, I’ve now got a perfectly fine NES. Ok, so the red and brown wires are in fact the main power switch wires. They originally connected to the main board (with the white, yellow and orange), and were routed to the RF-modulator. I _guess_ the power switch would no longer work, since the part it was connected to was gone. Also, it makes sense to me to have the power switch as close to the power connector as possible. I’ve added a couple of pictures. I hope this helps! This entry was posted in Electronics, Games. Bookmark the permalink. i know this is a pretty old post now but i had some questions if your still active. This is awesome! I’ve been looking for a way to get rid of the RF box to fit my console in a different case. Everything else are those portable rigs. 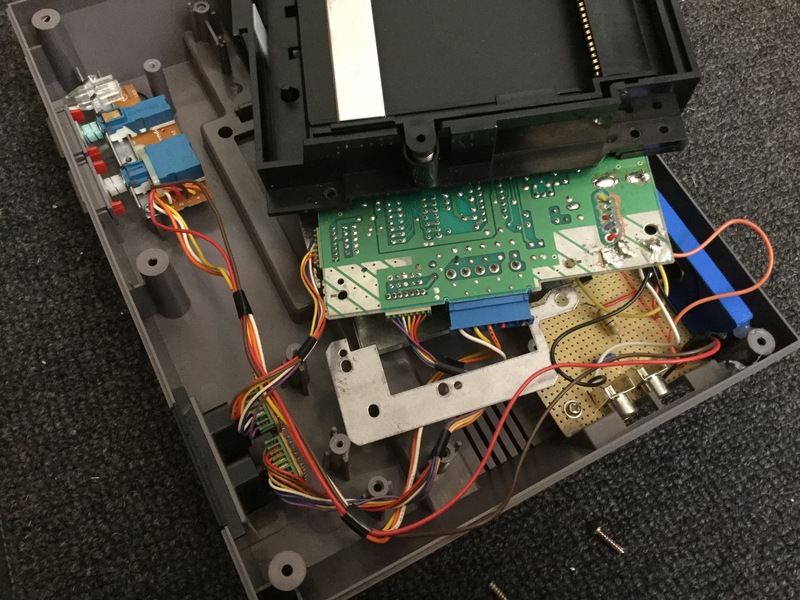 – I don’t see the point “replacing” the two of the wires coming from the NES power/reset button unit and not utilizing the original pins. So you’ve added the heads not to you them? Instead you decided for cutting the original wires? Where is the gain? What is also not clear is how you wired up the reset(brown) button. Can you give more details? I am sure this post will still be useful to a lot of people. Thanks for taking the time to create! It’s been a while so I can’t really remember the details. I’ll have to open the unit and have a look. I’ll get back to you, hopefully in a few days. The red and brown wires you’re using for Power/Reset are the same signal as pin 4 & 5. There was no need to move wires around, just solder to those pins. 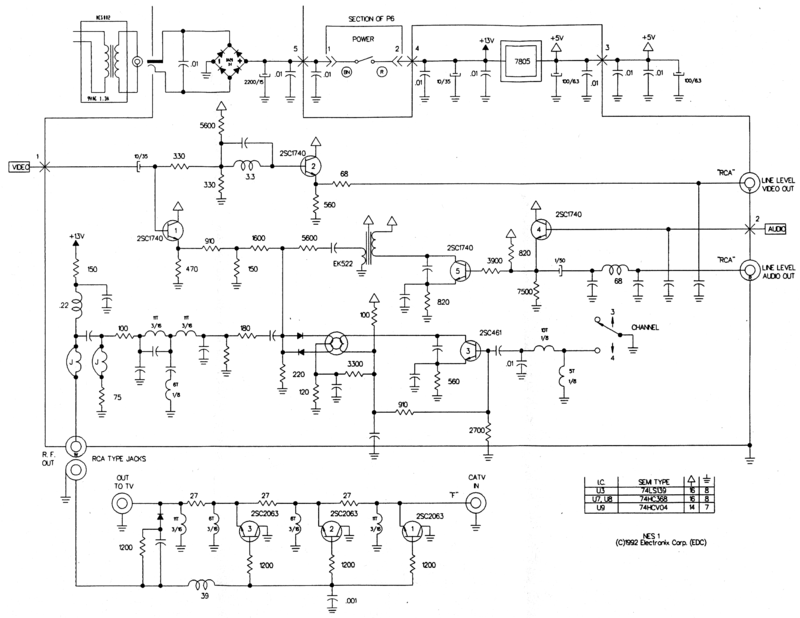 Here’s the schematic for the RF Module. https://console5.com/techwiki/images/5/58/NES-001-Schematic—Power%2C-AV%2C-RF-Switch.png The only missing part is a capacitor, but you’re missing a bunch of caps already so it wouldn’t matter anyways. Hi, did you figure out what was that “hum in the audio”? No, I couldn’t be bothered with it. It’s good enough for me! I think that “hum audio” comes from that “5V wall wart to use as the PSU”. That’s actually a pretty decent guess. I might try testing powering the unit with a battery to see if that’s the case. Thanks for the tip!